Antonio ‘Almi’ Almacen, a long lost cousin I have not seen in 35 years, who like me was a Guinacot “askal”, now the big boss running the operation of San Miguel Corporation in Beijeng, China, emailed me to share a very inspiring story which he thinks every Danawanon must read and reflect on. 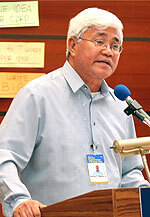 “Tony Meloto, the visionary and driving force behind the Gawad Kalinga movement, was conferred with a Doctorate of Humanities, Honoris Causa, by the Ateneo de Davao. Today, I feel intelligent. Not only am I addressing some of the brightest minds in Mindanao, but I am also being honored by this prestigious university with a Doctorate in Humanities, Honoris Causa. This is the first doctorate that I have received and I am accepting it in all humility and pride as a recognition of the nobility of the cause and the heroism of the thousands of Gawad Kalinga workers that I represent. Thank you Fr. Ting Samson and Ateneo de Davao for bestowing the highest academic degree on a man who was born without a pedigree- the ‘askal’ (asong kalye) who went to Ateneo and came back to the slums to help those he left behind. To a person like myself who did not excel in Ateneo in my pursuit of a college degree, receiving this Ph. D. is extremely flattering being fully conscious that my principal role in this movement is to be the storyteller of the many who put in the sacrifice and the hard work and yet have remained mostly unrecognized. It is also exhilarating because it builds on the growing global awareness, triggered by Gawad Kalinga and other movements that have not given up on our country, that the Filipinos can and will build a squatter-free, slum-free and hunger- free Philippines by committing their collective genius, passion and strength towards restoring the dignity and the potential for excellence of the poor, the weak and the powerless. LAST week’s piece on the nineteen-eleven earned an email from Mr. Ramon “Boboy” Durano IV (boboy_rd @yahoo.com), former city administrator, vice mayor and councilor of Danao City. I emailed him back and asked about the treasure trove of firearms and firearm-history that he calls his hometown. His reply deserves to see print. “Based on my little research, the gun industry in Danao started around 1905-1906 and one of the most popular gun maker at that time was a certain Mario Durano. I don’t know how he is related to us. “I have a piece that was supposedly made by him in 1912. It is a revolver chambered for cal. 32, made out of bronze and patterned after the revolvers used either by the Spaniards or the early batch of American soldiers sent out to fight Aguinaldo. Gun making was then considered as a backyard industry, of course, and outlawed by the government. “When World War II came, the Danao gunsmiths went underground, joined the guerrilla movement or were inducted into the USAFFE under the command of Gen. Douglas McArthur. “Their task was to re-chamber the Japanese Arisaka rifles to fit the US cal.30 round or kept the original Japanese rifle in good serviceable shape for the use of our forces. “After the war, there was a lull because of the proliferation of US surplus goods, among them firearms. “The industry went on, still underground. 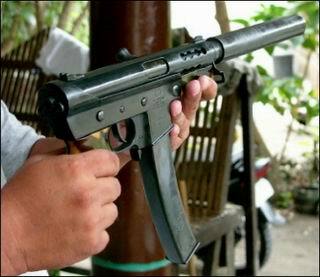 Until the ’60s, somebody coined the word ‘paltik’ to the guns. The brand made it popular and, being synonymous to Danao, people now began to realize that there was something, a special skill, that is embedded in the Danao gunsmiths. Two DAUSA Medical Mission indigent patients whose cases were extremely delicate for local hospitals to handle, are finally coming to the U.S. on May 19, through the assistance from Mending Kids International. Merylou Laurito Barriga, 11 years, old has an extreme facial deformity. The girl was brought by her parents to the DAUSA Medical Mission every year since it started in 1998. DAUSA’s partner, the St. Martin de Porres Catholic Medical Mission Guild, tried helping little Merylou through referrals to Hongkong and South Korea hospitals, but their efforts were unsuccessful. Keith Casas Montesuso, 8 years old, has multiple heart defects, in and out of hospitals in Cebu, and still in fragile condition, because his case requires open-heart surgery which could cost well over a million pesos at Cebu Doctors Hospital, and more, if done in Manila. Sometime last year we sent an urgent appeal to Mending Kids International, a charitable non-profit organization based in Valencia, California. MKI is known for helping kids from all over the world whose medical conditions could not be helped in their home countries. Among those that MKI had helped were a conjoined twin from Guatemala. (This was in the news, maybe 2 years ago, a rare case of twins joined in the head and separated successfully).